I've had a few folks reach out curious how I'm cleaning out my closet by selling stuff on Poshmark. I'm kind of addicted, actually... and I've made over $400 since June (Note: as of 1/20/2016, to date I'm over $2500 in sales) getting rid of stuff I don't wear or use anymore. 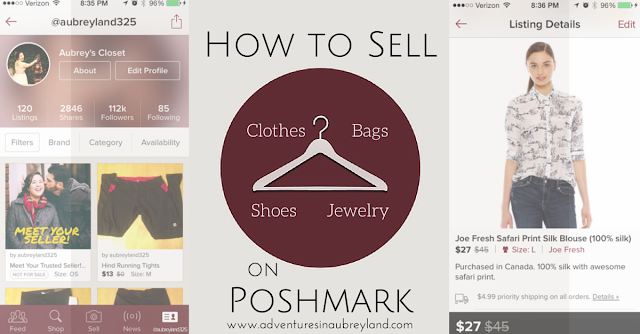 There are a lot of ways to sell your secondhand stuff out there: eBay, Craigslist, and sites/apps like Poshmark and Threadflip. Depending on what you're selling, you'll get different rates of success. I also used to do consignment, but I like getting a bigger cut of my earnings via online sales. It's all on my iPhone! Photos, descriptions, etc. You don't pay shipping as a seller (the buyer does). Poshmark sends you a pre-paid shipping label. They handle all the payment stuff, then you can direct deposit into your bank account. It's not an auction, so you set the price. It's easy to sell quality, brand-name stuff if you price it right. You can negotiate, and bundle items for a single buyer. It's social. I've interacted with some great women! Build quality listings! It's user-friendly, but there's still work involved. Be descriptive, and fully disclose any flaws. Also keep in mind you may be asked to prove the authenticity of items via serial numbers and tags. Use it to sell your brand names. I'm sorry, but even high quality shoes, leather jackets, suits, etc. won't sell for more than pittance if they aren't popular brands. Price realistically. I don't get hurt feelings about this. You can't sell an item for retail. Think about what you would pay (and bear in mind $5-7 shipping!) and price that way. Promote your items. You do this by sharing, responding to comments/likes, and posting great photos. This includes participating in Parties throughout the day and matching those themes! Negotiate, but be smart about it. There are lowballers out there. Just ignore them. And if you negotiate, remember comments cannot be deleted, so if you agree to lower a price, you're stuck there. USE THE OFFER FUNCTION! And ask that prospective buyers use it too. Share, share, share. It's courtesy to share a person's item if they share yours. Return the favor, and you'll get more eyes on your items. Keep padded envelopes on hand. I buy them cheap and then just pack and label. I also use the 24-hour package drop-off at my Post Office so I can mail orders anytime it's convenient. Some items just won't sell. If an item won't sell for $5, it's not worth the envelope and a trip to the post office to me. I delete stale listings and add those items to my donate pile. At the end of the day, I'm not in it to make money, just recoup some costs on items I would otherwise just give away. Also, It's against Poshmark's policy for you to take a sale "offline" and go the PayPal route. You lose your Poshmark protective layer if you do this, so seller/buyer beware. P.S. If you join Poshmark, use my code HROMR when you sign up to benefit from referral perks, usually you get $10 right away to shop, and I earn something when you make your first purchase! P.P.S. (1/1/2014) I sold a Michael Kors bag on Poshmark, but the buyer claimed that it was not as described (size/shape) and filed a claim for return. Because I disclosed every dimension, had a full description, and posted plenty of photos, Poshmark stood by me and the sale was final. That is the benefit of going through Poshmark and not cutting corners with PayPal. Well worth the 20%. P.P.P.S. (4/27/15, updated screenshots) I'm still using Poshmark, though less frequently than before. I hosted the first Poshmark party of 2015, and I've now got over 100K people following my closet. Share, share, share to grow your following, and become a Suggested User by following the rules! (1/20/2016) I'm still using Poshmark, have over 200K followers, and I've made over $2500 since I joined by selling the stuff I don't wear/use anymore! Also, an item I sent to a buyer got lost in the mail. But since it was via Poshmark, they refunded the buyer their money AND I got paid. Again, this is why you give them the 20%; protection in case you need it. POSH is the best! That's how I found your blog! It is! Even when sales are slow, I still enjoy the chase. I actually considered going to PoshFest because I originally had a work trip to Vegas scheduled that week, but then that was cancelled so no dice. I had no idea that is what originally brought you here. :) Makes my day! I'll go through waves of sales. I sold a ton over the weekend, but didn't sell but maybe $30 in July. Bummer! I'm hoping they bring some parties further East. I'd love to go to one. I've met some really sweet ladies on Posh. It's more of a community than just a selling site- like you said, it's social. I think it's when you download the phone app. The phone app is the only way you can list/sell things. Is there a way you can lower shipping price? I always see others posting that they will lower shipping price. Elisa, if the user is a compliant Poshmark seller, all orders cost $4.99 and are Priority Shipping. That is standard across the board, unless Poshmark is running a promotion where it is reduced for a limited time. One way that the seller can stay within the rules would be to discount the product to essentially transfer you that savings in "shipping", or to build a bundle for you with multiple items which means you don't pay $4.99 for each individual item and potentially get a discount from the seller for buying in "bulk".